Bad shower drain odors can range from mild to knock you down rotten smelling. Drain odor is usually caused by clogs in plumbing that is evidenced by a slow drain or by a buildup of soap scum in the drain. With a little bit of maintenance, drain smell can be eliminated. Preventative routine drain maintenance will keep your drain fresh. Clean the shower with a sponge and shower cleaner to remove soap scum, mildew and dirt. 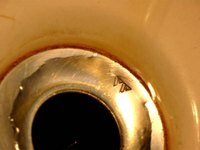 Sometimes the smell is not really coming from the drain but is rather coming from a dirty shower surface. Remove hair and debris from the grate over the shower drain, if one is installed. Hair and debris stops the shower from draining properly and produces a smell on its own. Unclog the shower drain if it is draining slowly. Slow drains mean there is a buildup of debris in the pipes. This buildup causes a bad odor. Use a plunger to unclog the drain. If a plunger does not work pour a drain cleaning solution down the drain. Drain cleaning solutions can be purchased at building supply and plumbing supply stores. If neither the plunger or the drain cleaning solution is effective, use an auger to clear the blockage. If you do not know how to use an auger or if the auger does not clear the drain, call a plumber for assistance. Eliminate odor with baking soda. Pour 1/4 cup of baking soda down the shower drain followed by a gallon of hot water, to absorb and remove odors and freshen the smell of the drain. Make it a regular weekly routine to use baking soda in order to freshen drains and prevent drain odor from building up in the first place. Call a plumber if none of these methods work to eliminate bad shower drain odor. Odor that persists after using these remedies may be caused by serious plumbing problems. What Causes a Bad Smell in the Back of a Fridge?